With the TDSF I tried to find out how much you can reduce the weight of a 700-class helicopter without sacrificing stability and flight characteristics. 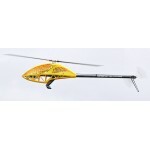 With a take-off weight of only 2400g (including 570g battery), it is thus lighter than some helicopters of the 500 class. The term “Slow-Flyer” is intended to show parallels to the extremely light wing models of this sector. The complete mechanic with canopy weighs just under 1100g without the other components. Despite the extremely light and compact design it is a full reliable and robust helicopter, which can be flown without restrictions and achieves amazing maneuverability and aeronautical precision. The goal was to create a helicopter, which achieves with extremely small and light drive components, and just a 5s battery almost the same performance as machines with the same size, conventional motors and 5kg. 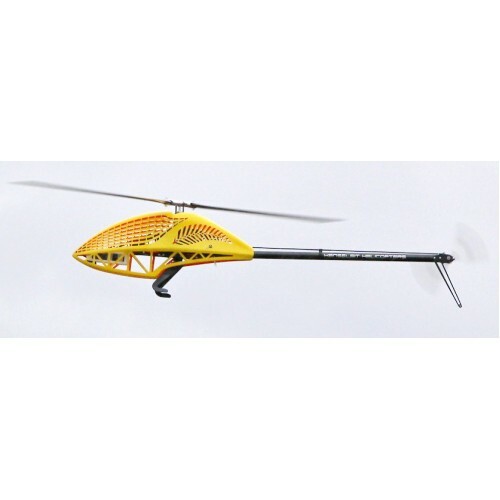 A maximum speed of 1500 rpm at the rotor head due to the minimum rotor disc load is sufficient to fly all 3D maneuvers easily. 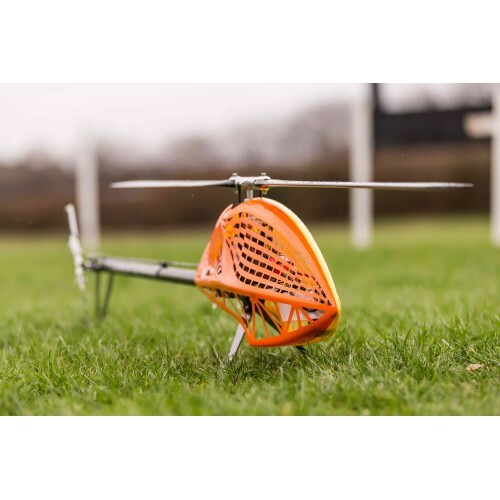 For example, Special 713mm rotor blades with a blade weight of only 125g / blade, which results in a tremendous agility with nevertheless very stable flight behavior. Again, I wanted to go new ways. The helicopter did not use anything that was not absolutely necessary. Also no one way bearing is provided with this machine, because training auto rotations anyway are not necessarily advisable due to the low masses. For an emergency auto rotation, however, it will work, because the small motor used has only a very little braking torque. However, I have maintained my Linear Drive System, which has now been optimized so far that it plays no role in terms of weight. I did not want to give up the advantages of control precision over a large pitch range with this machine. 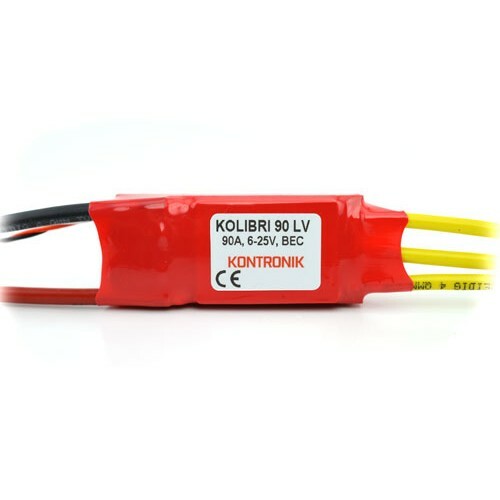 Generally, the machine is designed for midi servos. 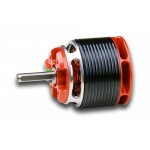 The motor should be a Mini-Pyro with 5mm shaft or a similar drive. A low voltage ESC with 90A is sufficient. (Recommendation see technical data on the back of the sheet). The recommended drive set works absolutely in a save range and only gets moderately warm during operation. The structure is similar to my all-round Fun helicopter TDF, where I've gone new ways to save even more weight. The chassis is a bit narrower and no longer screwed, but tine connected and glued. This results in an extremely torsion-resistant, lightweight and stable construction. The tail tube is a thin-walled 28mm carbon tube without struts. 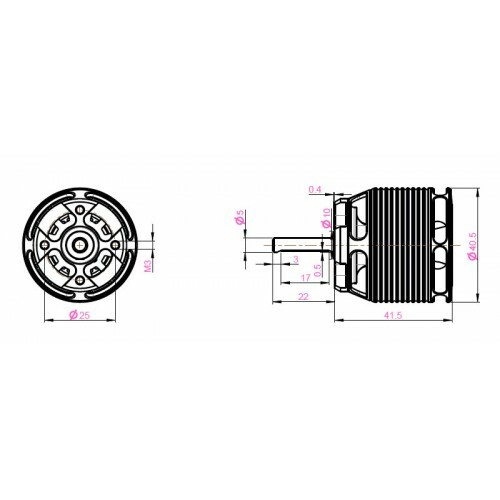 The swash plate is smaller and the rotor shaft is a 10-mm aluminum shaft made of high-strength aluminum. 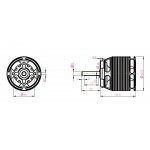 The rotor head central piece with feathering spindle is only one compact part. Due to the moderate rotor head speed in combination with the low blade weight, the centrifugal forces are just reaching 150kg and are thus far below the conventional values. 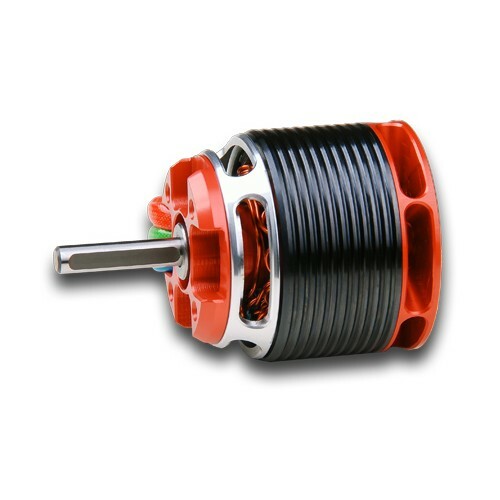 The main gear ratio is 11,33: 1 for small motors with approx. 1000kv in 4s-5s operation. The tail rotor ratio is set at 1: 6,7 so high that the helicopter has a very good and crisp tail rotor effect in its optimum operating range between 1100rpm and 1500rpm, which is in no way inferior to conventional machines. Again, I use my since 10 years proven canopy of the TDR, where I have come up with something special to underline the extremely low weight of the model. After lamination, I machine the canopy on a CNC machine in a rather complex operation. The window is stylized with small rectangular cutouts and in the back area I have indicated the contour of a bird feather. In the lower area, triangles are milled in order to achieve a filigree, helicopter-fitting design. Sticking on design foils is unnecessary and the canopy is only 120g despite the size. Optimal cooling is always guaranteed. The canopy I offer for the TDSF will also be available in different combinations, with different colors at left and right canopy half. For the TDSF-kit delivery we will also offer most of the recommended equipment.